If this year’s Sundance Film Festival is any indication, virtual reality is about to hit the mainstream. Under a programme called New Frontier, the festival is promoting eleven independently produced VR films. The finalists have been chosen from hundreds of entries, and among them are some short documentaries, horrifying acid trips, and even a Reggie Watt music video. You can watch them using Google Cardboard on your smartphone by downloading the Sundance VR app. The shorts will be available until February 12th. One of the standout shorts, Defrost, is a sci-fi futuristic drama that follows a woman who suffered a massive stroke and was cryogenically frozen. (It’s the VR debut of Grease director Randal Kleiser and it stars Carl Weathers.) The woman’s waking up 30 years later as the film begins. The viewer experiences the story from the perspective of the woman, Mrs. Garrison, who’s wheeled around the hospital after awakening and is reunited with her very emotional family. Though it’s not exactly the most original story, it’s the first time I’ve seen VR add a new dimension to storytelling. Experiencing the scenes from the perspective of the woman adds more of an emotional wallop, because it feels so much more realistic than a 2D movie. When a doctor leans in to touch the Mrs. Garrison’s knee, it feels real. It feels like there’s a doctor in the room you’re sitting in. And when you look behind you and see the guy pushing your wheelchair, it immerses you that much more in the fictional world. 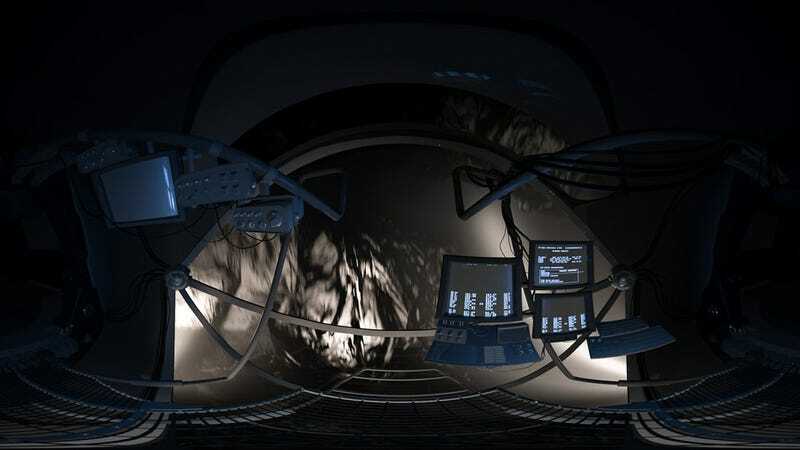 Another great VR story from Sundance this year is Sonar, which places you in a command centre where you’re watching a drone explore the insides of an asteroid following a distress signal. Spoiler on this one: You find a cavern full of petrified human corpses. Yeah, get me the hell out of there. All of these awesome VR experiences aren’t without some shortcomings. For one, the picture quality isn’t great. With Defrost, it seems like things were less fuzzy and the resolution was better when characters weren’t moving around as much. That would have been a huge setback in an action sequence or something more interactive. The quality wasn’t great with Sonar, either (but again, we were viewing this on Google Cardboard, not Oculus), and I felt like the scenes changed too quickly for me to get completely immersed in the story. And again, since I was viewing these on Google Cardboard, my arms got tired from holding the headset up the whole time. He also had huge fangs and followed me everywhere I looked. 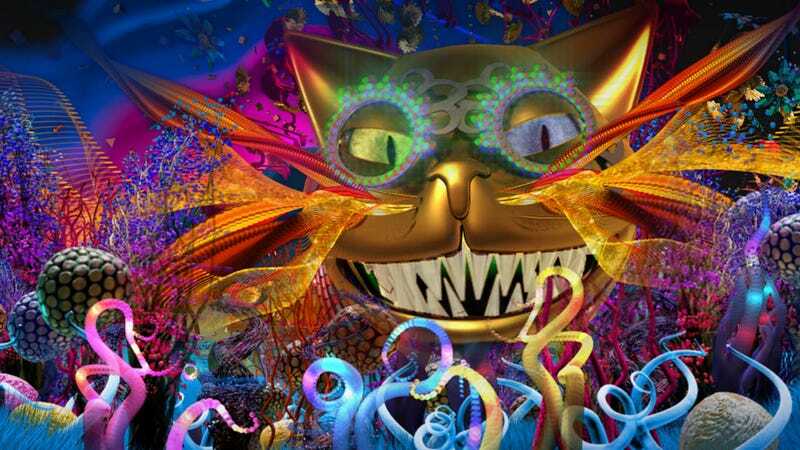 In the background was the sound of a broken record with a British woman going “puuussycat, puuuuussycat” aside the golden cat-dragon’s siren song. I felt trapped and threatened and deeply disturbed. DO NOT consume any mind-bending drugs while watching some kinds of VR, is all I can wager. I’m waiting for the Surgeon General warning to go along with this. It’s all kinds of crazy. All in all, though, the Sundance VR experiences show that virtual reality storytelling gives us greater emotional access to the characters, as well as an unprecedented sense of oneness with the scene. But there are still many things I’d like to see: Image quality that’s on par with normal HD movies, pursuing cinematography that gets the most out of the technology, and coming up with a way of making VR movies accessible, affordable, and mainstream. When I interviewed the New York Times about their VR storytelling app, I learned that some people are already considering 2D movies obsolete—dubbing them “flatties.” These Sundance selections could definitely be the very first nails in the flatties’ coffin.